I thought I’d take some time off from the blog during the holidays but as we were planning all the food that we’re going to make this weekend for our New Year’s party, I had this urge to create something delicious and share it here too. So here I am with some yummy sweet potato crostini! 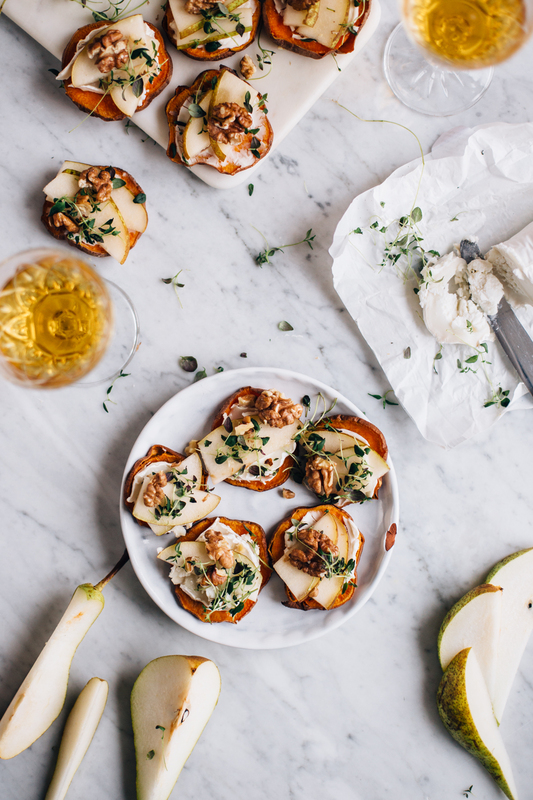 A.k.a the perfect appetizer or snack to have with your choice of bubbles this weekend (I’m thinking about a cocktail with kombucha!). A true lover of Italian food would probably say that calling this a crostini is a total lie, as it’s missing a key ingredient: the bread. 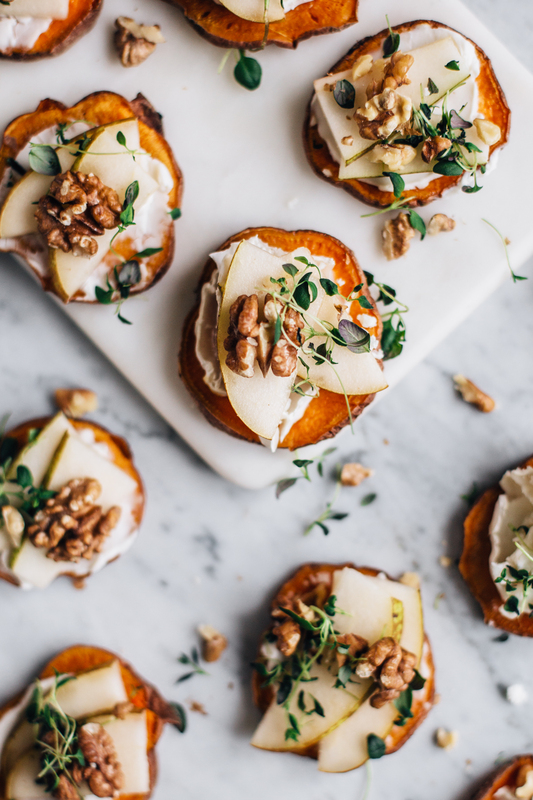 But as I’m a fan of doing something creative with the classics, I used thinly sliced and baked sweet potato as the bread and it turned out to be great with some cheese, pear, walnuts and thyme. I used both goat cheese and a vegan soft cheese and I think they’re both delicious – you wouldn’t even think these were vegan unless I told you. The flavors are just so great together and these make a very pretty appetizer, don’t you think? So if you’re looking for something easy to impress your friends with, these are a great option. notes: you could try another cheese, like blue cheese or your favorite vegan cheese too in these if you like. or use apples or fresh figs instead of the pear if they’re your favorites! 1. Preheat the oven to 440 F / 225 C degrees. Wash and dry the sweet potato thoroughly and cut it into half-inch / one centimeter thick slices. Spread sweet potato slices onto a baking tray covered with baking paper and grease lightly with olive oil. Bake for 15 minutes, take the tray from the oven and turn the slices and return to the oven for another 15 minutes, until the sweet potatoes are lightly browned from the edges. 2. Let the sweet potatoes cool slightly and cut the pear and goat cheese in the meantime into thin slices. 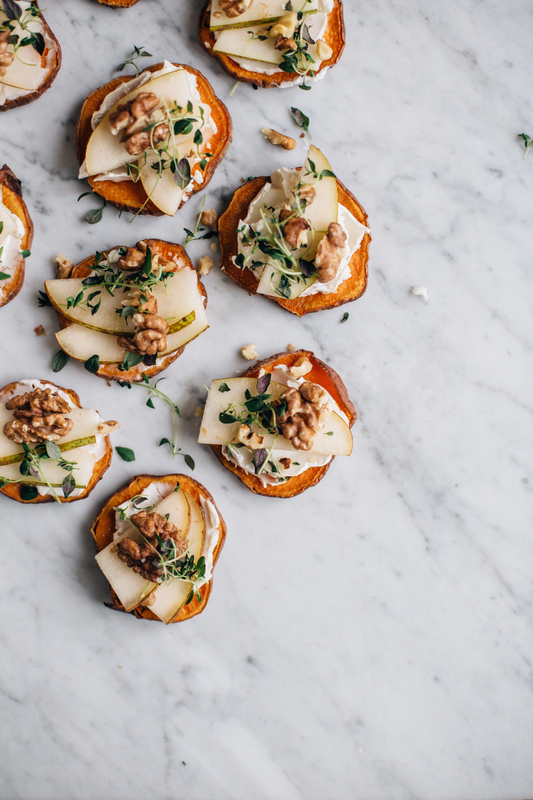 Assemble the cheese, pears, walnuts and fresh thyme on top of the sweet potato slices. Serve and enjoy! Tagged appetizer, grain free, snacks, sweet potato, winter. This Date Bundt Cake is gluten-free, vegan and naturally sweetened and it has all the Christmas vibes thanks to cinnamon and gingerbread spice! These tasty Super Veggie Sandwiches are filled with beetroot hummus, cream cheese, avocado and lots of greens and they're entirely vegan! Such an easy and lovely recipe, I already love the combination between sweet potatoes and goet/vegan cheese but never tried to eat them like you presented them! Can’t wait! Wishing you much love and inspiration for 2017, Tuulia! This recipe looks awesome! And I just loved the link to your wedding post…what stunning photos. Happy New Year!